"I think the attention span required to really get a sense of satisfaction from a Final Fantasy computer game, or San Andreas, or GTA...the dedication, the concentration required by that...I think equips kids really well to cope with the complications of narrative and actually makes them an awful lot less naive than maybe our generation was when we were that age, about interpreting Shakespeare...much more skeptical, much more used to intervening and making choices." Which reminded me of the little article posted above from Wired. 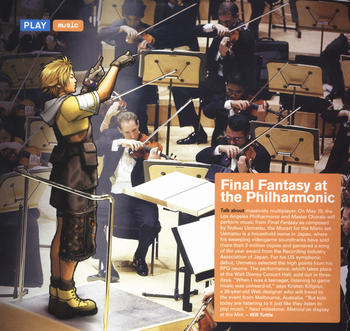 Orchestral performances of the Final Fantasy soundtrack are popping up in concert halls all over the world. And I was reading Icon magazine - reviewing GTA: San Andreas as a design/architecture exercise. Which reminded me of this fantastic post over at thingsmagazine.